Those colored sticky notes have been attracted by the ongoing Super Mario video game, so they decided to create a unique Mushroom Kingdom with themselves. If you’re curious, let’s go on checking the Super Mario stop motion video. Zach King, a senior in film school at Biola University and the master of Final Cut King, created the awesome Mario themed stop motion video using 7,000 post-it-notes. No doubt, it’s a big challenge because the maker must use these colored sticky notes to built the whole scenes originated from Mushroom Kingdom, and as we can see from the image, Super Mario and other characters also feature post-it-note costumes, but apparently the big job is well worth, the sticky notes have brought us a perfect pixelated world. 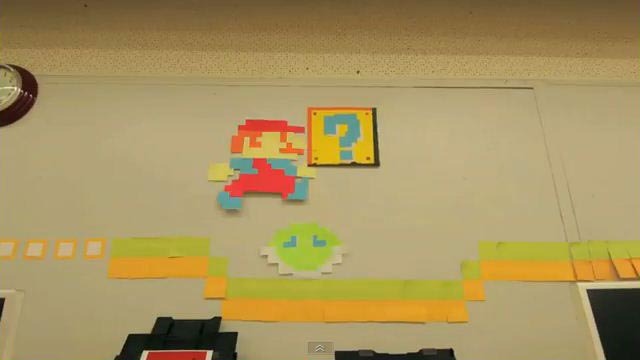 After the break, check out the Super Mario stop motion video created with post-it-notes. Additionally, also don’t miss other wonderful stop motion videos such as the beaded Mario stop motion video and the Minecraft-based Mario stop motion video.